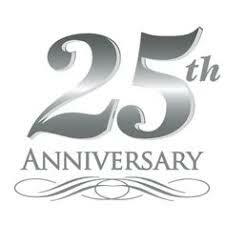 The Freethought Society (FS) is celebrating its 25th year of operation! To date, the FS Ezine/newsletter is sent to over 7,000 recipients, FS’s Meetup page has almost 1,300 members, the FS Facebook page has thousands of followers, and FS events take place all over the country (some abroad), with volunteers eagerly participating. It appears that FS is thriving — and 25 more years of serving the nontheist community is on the horizon. The FS Philadelphia location anniversary celebration will include three options for participation. Past speakers will be attending. Comedians Leighann Lord and Steve Hill will perform after dinner. The full 25th Anniversary package with a happy hour, includes wine bar, dinner and comedy show is $100. Dinner and Comedy show is $75 (includes wine bar and live-dinner music featuring Christine Jones on the piano). Comedy show only (includes wine bar) is $25. Note: IDs will be checked at the door upon entering. No drink wristband will be given to students under 21 years of age. We hope to see you there, but if you can’t attend, please send a congratulatory message of encouragement. Congratulatory messages will be collected throughout the year, published periodically and read aloud at the anniversary events. See the messages of congratulations we received. Thank you everyone for your generous thoughts and well wishes! The Freethought Society is helping to kick off the 2017 Pennsylvania State Atheist/Humanist Conference with its world-famous Friday-the-Thirteenth Anti-Superstition Bash, also known as The Friggatriskaidekaphobia Treatment Center. Please join us on Friday, October 13, 2017 at the Philadelphia Embassy Suites (9000 Bartram Ave), as we put willing participants through an anti-superstition obstacle course, dance to superstition-themed music, create an individual unique silhouette souvenir (at a non-superstituous cost of $13), play anti-superstition games, drink Love Potion #9 (also non-superstitiously priced at $13), enjoy our entertainers, walk-through the Museum of Superstitions and socialize with like-minded folks. Tickets may be purchased for the Friday night Friggatriskaidekaphobia Party only, day passes for Saturday and/or Sunday, or a full Standard or VIP Weekend Pass to enjoy the entire slate of activities and presentations. There are many fantastic speakers on Saturday (October 14) and Sunday (October 15), including internationally known theoretical physicist Lawrence Krauss. The Freethought Society (FS) joins with The Freedom From Religion Foundation (FFRF), the American Humanist Association and many others in celebrating the unveiling of an impressive monument to the eminent civil libertarian who fought perhaps the most famous legal battle in U.S. history. The statue of legendary lawyer and rationalist Clarence Darrow is to be dedicated on Friday, July 14, right in front of the site of the historic Scopes evolution trial: the Rhea County Courthouse in Dayton, Tennessee. 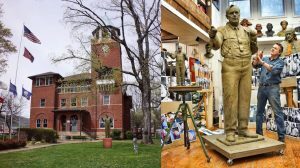 A local statue of Darrow’s legal adversary, William Jennings Bryan, given to the county by the William Jennings Bryan College, inspired talented sculptor Zenos Frudakis and others to seek to remedy of the “missing link.” Darrow will soon take his rightful place adjacent to Bryan on the courthouse lawn. Darrow defended John Scopes when he was charged with teaching evolution at the 1925 “trial of the century” (The State of Tennessee v. John Thomas Scopes). Frudakis, based in Glenside, Pennsylvania, is creating the 7-foot bronze statue of the famed attorney, to be installed July 13, 2014 upon a 3-foot high base. Frudakis is a renowned American sculptor who has created an extensive, award-winning collection of more than 100 bronze sculptures in public and private collections. FFRF is contributing the lion’s share of costs: $150,000, made possible through the generosity of its members. The dedication will begin in front of the courthouse at 10:00 AM on Friday, July 14, 2017 and will include actor John de Lancie, who played Q in Star Trek: The Next Generation. Andrew Kersten, author of the 2011 biography, Clarence Darrow: American Iconoclast, will speak about Darrow and his “frenemy” relationship with Bryan. Kersten is dean of the College of Letters, Arts and Sciences at the University of Idaho-Moscow. FFRF Co-Presidents Dan Barker and Annie Laurie Gaylor will also say a few words. Barker, a professional musician, will set the tone prior to the dedication by a rendition of music from the 1920s. The short dedication will end with Frudakis, Barker, Gaylor and de Lancie unveiling the statue. Margaret Downey, FFRF board member and president of FS will emcee. “I am honored to be the emcee for this historic event and thrilled to see that both attorneys involved in the trial will be represented at the Rhea County Courthouse. The accurate representation of the trial and the talented attorneys involved will surely draw many visitors to the lovely city of Dayton, Tennessee,” says Downey. The 2017 Scopes Trial and Festival will kick off shortly after with bluegrass music, booths and other festivities.